Are you looking for a solution to your IBC tote contents freezing? Powerblanket’s line of flexible, wrap-around tote heaters are ideal for warming IBC totes and other portable bulk containers. The blankets create a barrier of heat around the tote to insulate and protect a wide variety of temperature-sensitive materials and their dispensing systems. Discover our revolutionary heat spreading system, designed to provide a highly efficient and uniform distribution of heat through your tote, while only consuming low levels of energy. The technology allows totes to be rapidly and consistently warmed without creating the hot and cold spots common with our competitors. 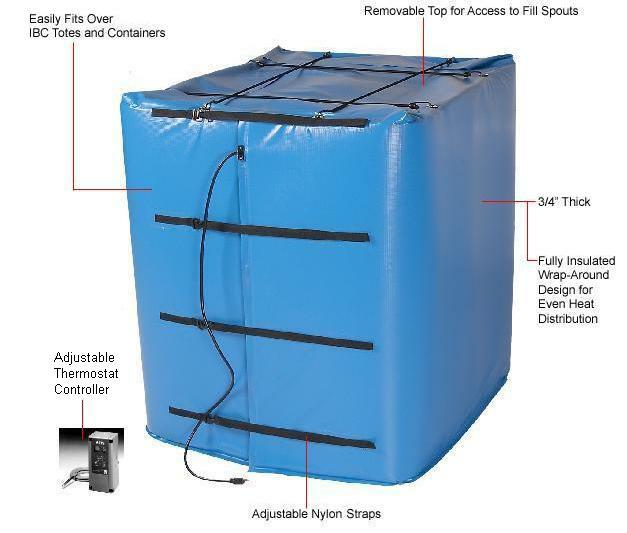 Adjustable nylon straps easily secure the lightweight blankets and provide a snug fit to maximize heating performance. Powerblanket tote heaters are safe to use on both metal and plastic containers, and help maintain flow, viscosity and workability. Each blanket’s durable outer shell is winter-proof and water resistant. This feature makes it safe to keep your products in a snowy or rainy environment, without worry of the water penetrating through and causing damage. It also protects your dispensing system, whether that’s a hose, pump, or faucet. With a tote heater, you keep your dispensing hoses safe inside while still having easy access to them. The tote heaters are manufactured and certified to UL/CSA safety standards, and environmental standards. Furthermore, two available sizes, 275 and 330 gallons, fit most industry standard totes. Custom sizes are also available upon request. Each tote heater includes an adjustable thermostat controller and uses 120V electricity. An adjustable thermostat is great for changes in weather, which allow you to keep your products at the optimal temperature whether it’s freezing or just chilly outside. In conclusion, Powerblanket provides superior heating solutions for a multitude of applications. You can rest assured that your temperature sensitive product will be safe with a Powerblanket tote heater. Check out your options now and don’t be caught with a frozen tank! We are going to receive containters with this specifications 1000 L, Outside dimensions 42 3/4″x42 3/4″ x40″. Made of paper, and a plastic liner. Please call us at 888.316.6324 to get started on your order!